So you had a great summer. You went to California with your family and had some relaxing beach days, you hung out with your friends at the movies and got some frozen yogurt…maybe you binge-watched the latest episodes of your favorite show on Netflix. And just like that, 2 months had passed, and it’s time to start thinking about school again. No big deal right? You totally remember how to solve Y=log x for x when Y=10… Ok, maybe you’re rusty on that one. But you DEFINITELY remember what vociferous means. And munificent. If you didn’t just type any of those into Google to know what they were, good for you! But chances are there is something you forgot over your summer break, because we ALL do it. So here’s my Top 10 Back to School Tips for Teens, Middle and Elementary-Schoolers… and Parents! What does “being organized” really mean? It means knowing what’s going on in your life and when. This way, you remember to study for that test next week, and you remember when your next essay is due. Everyone has different ways to stay organized. What matters is that you do what works for you. What is going to help you remember to study for the SAT? Where is the best place for you to store homework assignments before turning them in? Erin Hintze, who we interviewed her senior year of High School, had this to say about how she stayed on top of things: Using this tactic, Erin was able to work a job and earn an Associate’s COLLEGE Degree during High School — See the benefits? This is just one example of how a REAL student stays organized. What are some other ways to stay organized? Do a quick run-through of your day in your head before leaving the house — Do I have everything I’ll need? First, it’s a good idea to check your progress so far. What do you remember from last year, and the years before it? Find out with a Progress Evaluation. Make sure that you’re taking the right classes. Taking AP and Honors courses can positively impact your weighted GPA. BUT, you may not want to do that… Wondering why? If your student is struggling with their regular courses, an accelerated or Advanced Placement course isn’t a good idea. 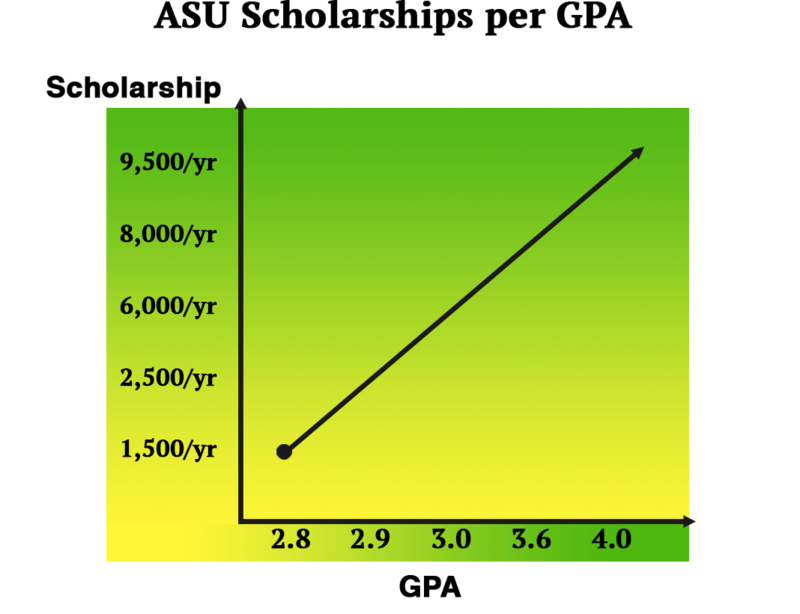 Instead of helping increase your student’s GPA, it will drop it down further! So make sure your student is learning at a pace suitable for them. Wait 3 weeks, then use our Teacher Evaluation Sheet. Using this sheet, you can get a good idea from your student’s teachers on how they’re doing so far, and what they may need to improve upon! My “sleep time”? Isn’t that what coffee is for? Impaired memory — When was the 19th Amendment passed?… And what was the 19th Amendment again?? In past blogs I talked about making SMART goals, goals that are Specific, Measurable, Actionable, Realistic, and Time-Based. What kind of SMART of goals should you set for your year? Then break those goals down EVEN MORE. — How am I going to run for NHS President? How am I going to ace my Biology exam? Implement those strategies and use them daily. In a blog on having the Extracurricular Advantage, I talk in detail about setting SMART goals for yourself. Once you set these goals you should track them in a daily planner. 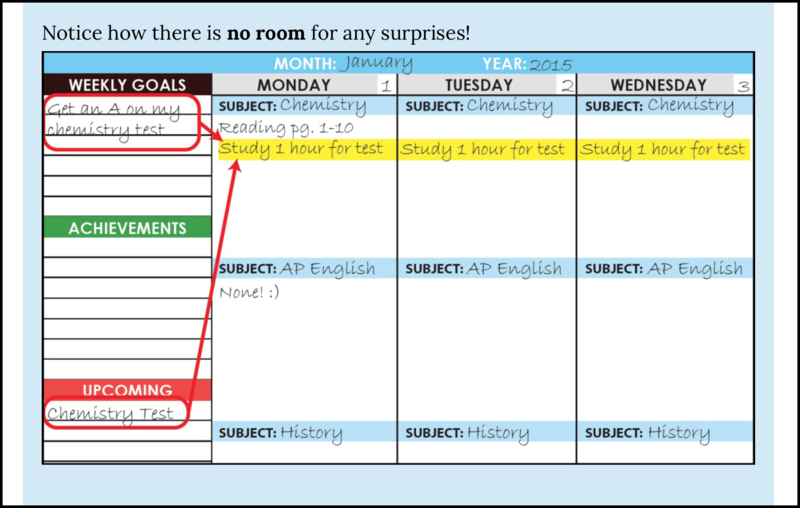 See how it’s used here in the Student-Tutor planner? What is your day-to-day going to look like? Where/when/how will I do my homework each day? Where/when/how will I study for my exams? Will I be participating in after school activities? If so, when? How many days a week? Do I need extra help on assignments? Will I be meeting with a tutor, teacher, or study group? As a parent, you can help your child with this. It’s important that they decide on times to do things. It’s also important that any distractions are limited. TV, for example. Your child may get home from school and plop right down in front of the Television. One episode turns into 5 and pretty soon it’s 6:00 pm and they have a 3-page essay due tomorrow — Yikes! 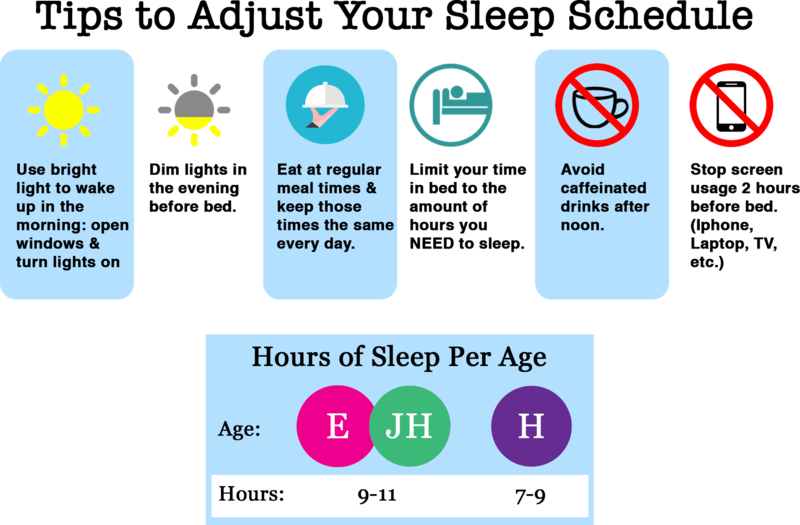 Here’s an example of how a typical day could be planned: This student is in K-8, so the optimal amount of hours they need to sleep is 11. They can do this by going to bed at 8 and waking up at 6:00 am. 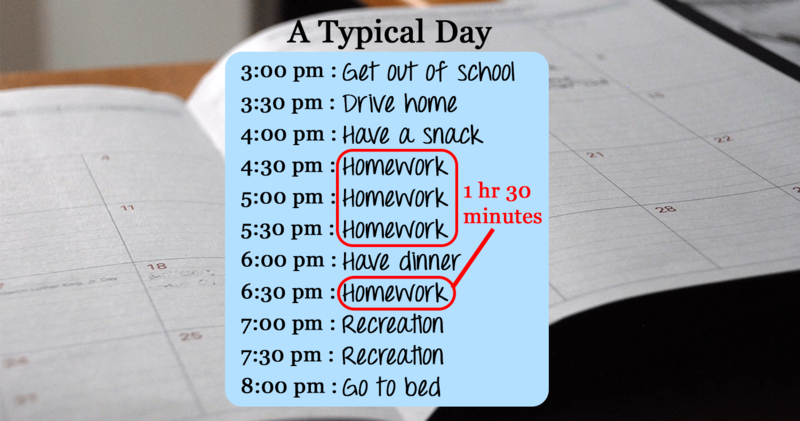 They have 1 hour and 30 minutes to do their homework every day, and 30 minutes to relax (an hour if you count the snack-time). You can help motivate your student by using a Rewards program. Make achieving their goals feel fun for them. This is especially a good idea with younger students… when they get older, they will start to see other benefits that come naturally with getting good grades. I want to use a Rewards program with my student. This is ideal for kids K-8 who are still learning basic concepts and fundamentals. Take advantage of free resources that will help them review what they previously learned. Hire a company like Student-Tutor to do an online math assessment test for you to pinpoint exact areas of academic difficulties! Be 100% sure your students is on the right track. For grades 6 and up, you need to start preparing for different exams that you will take, mainly: the PSAT, the SAT, SAT 2, and ACT. Find out where/when to take your exams, and how to prepare for them. The majority of us experience test anxiety, which is when we get nervous about doing well on exams and draw blanks about what we know. Read how to overcome test anxiety so you can be confident and get the grades you deserve on tests and quizzes. What do they want to study? Are they interested in any Elite Universities? What GPA and test scores do they need to get in? What other things does the school look at for admissions? They should also consider taking dual credit courses. Dual credit courses are High School courses that count toward your High School diploma AND college degree. I want to know more about Dual Credit Courses. Find out which classes you’ll need to take PRIOR to attending college. Money, money, money, must be funny in a rich man’s world… But seriously. Scholarships are the closest thing your student can get to selling their actual BRAIN–Meaning they can earn money for their smarts! Click here and attend a free webinar to learn more! Seek additional help from experts on unlocking scholarship potential like we do in our scholarship seminar! People care that I play the piano? So get your extracurriculars in order! Find something to excel at and DO IT. I want to optimize my extracurriculars. In conclusion, we all forget things over long periods of time. What’s important is that YOU and YOUR STUDENT know what your next steps are for someday getting them into the college of their dreams. Wow Bryan, thanks for sharing! That is super helpful information. I agree, textbooks can be quite the expense when it comes to school. Maybe we will write another article specifically on how to save money this way. Thanks for reading! School can seem really hard after you take a break like summer vacation, for parents and students alike, but you’ll all be back into the swing of things before you know it. Hopefully sooner rather than later, but so long as you try it will happen. My younger sisters just got off for the summer, I wonder how they did in their classes.